Elisa Ficarra graduated in Electrical Engineering at the University of Bologna, Italy, March 2001. In 2006 she got an International Ph.D. of excellence in Systems and Computer Science at the Politecnico di Torino, Italy. She was visiting scientist at the Computer Science Dept. of Stanford University (CA, USA) in 2002 and at the Integrated System Laboratory of EPFL, Lausanne, Switzerland from Jan. to Dec. 2005. Currently, she is Associate Professor at Politecnico di Torino (DAUIN – EDA Group). 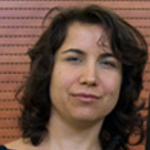 Elisa Ficarra is reviewer of many IEEE Transactions and other international journals (among them, NATURE Nanotechnology). She is TPC member of several IEEE/ACM conferences including ICPR and VLSI-SOC and associate editor of the journal IEEE Transactions on Information Technology and Biomedicine. She is local technical coordinator of several funded national and european projects.Her research activity concerns biomedical and molecular imaging, quantitative immunohistochemistry, algorithms for clinical genomics, gene expression analysis, miRNA target prediction, high-throughput sequencing analysis.